Interesting slides here on effective measurements for your Social Media Campaigns. Dell continues to Listen to their customer through it's communities and forums. Dell has profited by selling used equipment using Social Media. Social Media Can Be More Important to an organization During A Recession. 1 Customer Can Influence Your Brand Online! Mobile applications finally crossed the path of meeting the Enterprise as the Apple iPhone 3G debuted this year and offered one of the most superior and advance mobile operating systems to date. Combine that with data being transferred at 3G speeds and your iPhone is now a Mobile Customer Relationship Management application, or a fully loaded Expense Reporting system that can be just as effective as your enterprise applications at the office. According to Gartner, Smart Phones make up 35% of the cell phone market today and the trends of data traffic are drastically increasing across the enterprise and at the consumer level. Analysts estimate that more than 2 trillion text messages were sent in 2007 worldwide. A company called Portio Research (a company that provides research on the mobile market) predicts that close to 2.5 trillion messages will be sent in 2009. Whether your company has a mobile Sales Force, or your a road warrior that travels weekly - below are 17 applications worth downloading on your iPhone to stay connected, be productive, and work like you never left the office. The links to these applications will direct you to the Apple iTunes Store, so be sure to download iTunes if it is not already on your PC. SalesForce Mobile - Access leads, opportunities, and tasks with Salesforce.Com's mobile version of their tool. Requires a Salesforce.Com license. Search2Go for Salesforce.Com - This handy application allows you to access all contacts, accounts, and opportunities in a quick and efficient manner on your iPhone, and it's interface enables you to quickly view details or make calls. Learn more. Sales 2 Target - Use this application to calculate daily weekly monthly sales to hit your quarterly quota targets. SugarCRM for iPhone - This application is not free, but it was made by a third party partner that supports the open source CRM system Sugar CRM. Sugar CRM plans to release their own version in the near future. Fring - Keep in contact with your sales force or co workers via instant messenger from the office, at home, or whereever you are. This application works using your Skype, MSN Messenger, ICQ, Google Talk, Twitter, AIM & Yahoo accounts. See your buddies or co workers anywhere you go on your mobile. Loopt - Use this tool to know where your remote sales people are and when are they visiting their customers. This tool will ensure your boss will always know exactly where you are. Loopt is a location-aware social networking app—it uses the GPS chip in your 3G iPhone (or more crudely, with the cell tower location data in the first generation iPhone) to place you on a map and to show you where your friends are and what they are up to. Conference Call - This handy iPhone application enables you to schedule conference calls remotely while your on the road. The user interface links to your address book where you select those contacts who you want to participate on the call, schedule the time for the call, and this application will call every participant and bridge them on to your line by calling them. Sign up on their website and download the application on the iTunes store. Voice Broadcast - Also By Ifbyphone, this application enables you to record messages on your iPhone using the iPhone's recording software and then is voice broadcasts your recorded message to anyone on your address book. Learn more about it on on their website. Google Talk Mobile App - Download this application and you get several of the legacy Google Applications integrated into an iPhone like Gmail, Google Reader, etc. However, the powerful tool here is Google Talk which enables you to speak into your handset and find out where you can by lunch or where your next client meeting is. Mbox Fax To Email - This tool enables you to get faxes directly to your iPhone and much more. It is basically a communication hub right in the palm of your hand. Other capabilities include text and voice messaging. iDial U Drive - Lets you schedule multiple calls while you drive in a way that just requires you to touch one button on the screen. Save the time looking up contacts or dialing multiple numbers. Mocha VNC - Need to access files on another computer but your on the road? This is your solution to get your files on your iPhone by accessing your PC back home or at the office? Enterprise Email - With iPhone 2.0 software, iPhone does even more for your enterprise. It supports Microsoft Exchange ActiveSync, delivering push email, calendar, and contacts. Learn more about it here. Easy Writer - The iPhone's Portrait style keyboard is not always the most accurate way to send emails while your on the road. This handy application enables you to get a Landscape Style Soft Keyboard when sending email on the iPhone. Expense2Go For Salesforce.Com - A great tool for capturing your expenses while your on the road using the iPhone's camera to take snapshots of receipts, and sync them up into Salesforce.Com. Card Lasso - Scan your business cards using your camera, synchronize the photo in the cloud, and minutes later the card is available for syncing and downloading in SalesForce.Com, Outlook, or wherever. That is about it for now, but feel free to let us know what other applications should be on this list. I am certain we have missed a few so let us know. 2009 Budgets are in and for many who oversee the Operations and IT Budget, you are probably challenged to reduce your capital budget by at least 40% lower than what you originally put in. As the pressure to cut continues, you may want to rethink about the software vendors you have selected to introduce into the Enterprise, or even think about replacing your legacy Enterprise applications with more cost effective open source or lower cost alternatives. Still not convinced about Open Source or Lower Cost Alternatives? Well according to Gartner, approximately 85% of companies surveyed are already using Open Source Applications in 2008. The other 15% surveyed have plans to incorporate Open Source Strategies within their Enterprise in 2009. Whether your a small business, or you are looking to minimize costs - attached are some of the most cost effective applications on the market that can easily replace some of your more expensive Enterprise solutions and functions. Open Office - An excellent and free alternative to the expensive Microsoft Office Suite. The suite contains out of the box functionality that even Microsoft's Office suite does not ship with like the ability to convert files to PDF. Sugar CRM - A highly recommended CRM package that comes in a Free, Hosted, or Enterprise version. Open CRM - A U.K Based CRM Company that claims to provide free licenses to those who use it. OmniStar Kbase - A PHP based External or Internal Knowledge Management Software. O.T.R.S - The Open Source Ticket Request System that claims to be I.T.I.L certified. Save yourself 1/2 million dollars per year over investing in ITSM systems like Remedy or HP applications. This system includes many features to manage customer telephone calls and e-mails. The system is built to allow your support, sales, pre-sales, billing, internal IT, helpdesk, etc. department to react quickly to inbound inquiries. For a full list of Help Desk ticketing systems, click here. Track It Web - Also Claims to be I.T.I.L Certified, Open Source, and significantly lower cost. Jira - A flexible web based bug tracking, issue tracking, task tracking, and project management software solution. BaseCamp - I was just recently introduced to this application, and it seems like a great tool for collaborating on projects over the web with remote teams, vendors, developers, and co workers located in different locations. ActiveCollab - Another open source tool that is also compatible with iPhones. eRoom.Net - A hosted collaborative solution that provides mid sized businesses with world class collaboration software in a hosted environment. Alfresco Open Source Content Management - Open Source Content Management for your web site, Intranet, or all of the above. 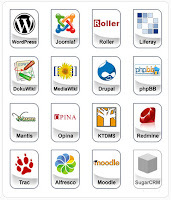 OpenCMS - Another Content Management application with great promise, and free to utilize. Google Analytics - By far one of the best free analytic dashboards for your web site. Get Clicky - This is Google Analytics, plus realtime results, and an iPhone friendly interface to track you web traffic remotely. JS Kit - A free tool that enables you to incorporate reviews, ratings, and commenting functionality on your eCommerce site or Blog section of your web site and report on it. 103 Bees - Find out how customers are getting to your website. This tool focuses on analyzing search terms and questions that people are querying for prior to getting to your web site. It's a great tool for understanding your customers and for identifying new market opportunities. vBulletin - Probably the best in class Forum software out today. A small license fee, and some configuration and your up and running. Dolphin Community Software - Build your own Community sites using this low cost open source platform. Ning.Com - Geared more towards hobbyists, music enthusiasts, and entrepreneurs - this free platform provides an array of easy to use and deploy community features for your web site. DimDim.Com - A great audio and web collaboration tool. Best of all it is free. Yugma - Another decent and free web collaboration and conferencing solution. Digium - This company offers telephony applications based on Open Source software that integrates with PCI telephony interface cards. The cost of their tools significantly lower than other vendors like Avaya, Nortel, and all the others. Zenoss Inc. - This company provides network, server, and application monitoring solutions in the United States and internationally. The company offers Zenoss Core, Professional, and Enterprise solutions that monitors IT infrastructure, including networks, servers, virtualizations, and applications, as well as provide configuration management, availability management, performance monitoring, event/log management, and automatic remediation services. Linux - This is the obvious platform these days, but I thought I would put it up anyway. According to a new Gartner study, About 52% of the companies surveyed are already using open-source server software and another 23% plan to use it within the next 12 months. However, Linux as an operating system for the desktop is much less established in enterprise use, with 39% of respondents in the Gartner survey currently using it and another 22% expecting to use it within the next year. Many of the vendors provide free distributions or are at significantly lower cost to some of the most complex tasks or functions that run your Enterprise today. MySQL - The best and most cost effective choice for a free SQL/Database environment that needs to be hosted in the cloud. For executives and managers driving Web 2.0 efforts this year, you may want to attend The Enterprise 2.0 Executive Forum 2009 on 24 February - full details on the website. Don't forget to subscribibe to the Enterprise 2.0 Forum blog.